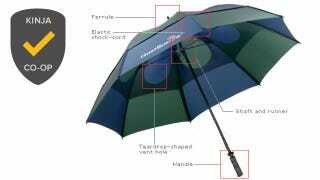 Taking down 34% of your votes without getting turned inside out, GustBuster is your choice for best umbrella. The other four nominees, all great for their own reasons, were only separated by about 6% of the votes, so be sure to check them all out if the GustBuster isn’t right for you. You praised the GustBuster for its value, different size and style options, weight, and of course its durability. Anecdotally it also appears to be a prime target for theft, so be careful out there. What product category deserves a vote next? Tell us in the comments.